TransCanada's strategy to hoister its Energy East pipeline on the Quebec public has been unmasked, and Quebecers don't buy the company's sales pitch. Quebec citizens, not to mention citizens worldwide, have done their homework and based on the science, the facts and the statistics are keenly aware that the risks inherent in this proposed pipeline. TransCanada's strategy to hoister its Energy East pipeline on the Quebec public has been unmasked, and Quebecers don't buy the company's sales pitch. Quebec citizens, not to mention citizens worldwide, have done their homework and based on the science, the facts and the statistics are keenly aware that the risks inherent in this proposed pipeline, a project endorsed by the federal government, are simply too great, and the required social acceptability for this project is not there, and never will be. We know that to determine the risk level and viability of a project you can calculate the probability of an accident and the cost of decontamination. This can mean hundreds of billions of dollars in decontamination costs and costs in relation to persistent pollution impacts. A good indicator in this case is TransCanada's dismal track record for pipeline oil spills in terms of frequency, quantity and response time. The figures speak volumes. 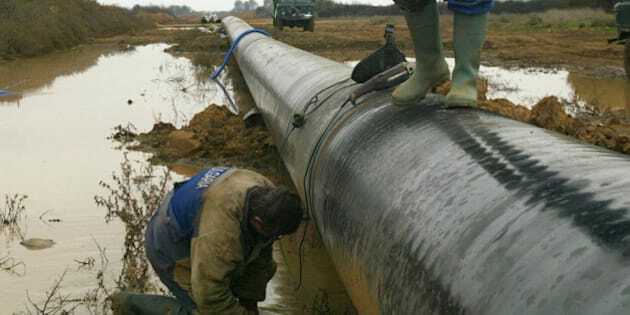 TransCanada wants to pump through the proposed Energy East pipeline 1.1 million barrels a day of crude oil worth $88 million per day, $32 billion per year and $320 billion per decade! But a single major oil spill could last 20 years and run Quebec taxpayers $50 billion in decontamination costs. The Energy East pipeline would cross 5 provinces and 960 waterways, including 20 waterways in Quebec providing drinking water to 40 per cent of the population. The pipeline would carry crude oil from the Alberta Tar Sands, which, with the federal government's blessings, plans to extract oil from the Tar Sands for the next 78 years despite the risk of massive devastation to northern Alberta. The world needs to reduce its consumption of fossil fuels by 70 per cent in the next 10 years and phase out fossil fuel consumption altogether within 35 years maximum if the human species wishes to survive in the livable conditions that only a stable and viable natural environment can provide. The priority for citizens is quality of life. This quality requires environmental integrity: integrity in the quality of the air, water, farmland, rivers, lakes and all ecosystems. It includes the electrification of transportation and leading-edge renewable energy technologies in a context of innovative long-term resource management. The benefits will be an economy ten times more robust than a fossil fuel driven economy relying on primitive technologies. Quebec has a population of 8 million and Quebecers are not interested in a project that generates 4,000 jobs for only 18 months with all the risks it carries for a sustainable quality of life. These views were made abundantly clear at the public hearings on energy issues conducted by the Commission sur les enjeux énergétiques du Québec in 2013. Our message is clear and we invite TransCanada and politicians to listen: Quebecers don't want the Energy East pipeline and the devastation it will bring.